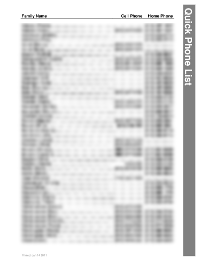 Members and Regular Attenders may download PDF copies of our Church Photo Directory and/or the shorter Phonelist. The directories downloaded will always be as up-to-date as our church records, so you may download them as often as you feel necessary to keep in touch with our community. In order to protect the privacy of our attenders we ask that if you download these documents you do not share them beyond your household. To receive your document, please type your email address in the box at right, then click the appropriate button. The email address you type must be in our records as the email address of a Church Member or a recognized Regular Attender. If your address is recognized, a copy of the requested document will be emailed to that address (note the "full directory" directory file is about 5 MBy, it will take a minute or so to send). If your email address is not recognized, you may contact the Church Office for help. 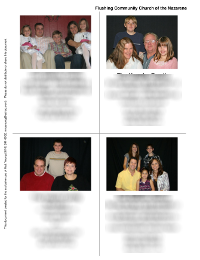 If your family picture is not included (or needs an update) you may send one to the church office or can have a photo taken by Don Korte most Sunday mornings after worship service.